What do Bill Nye the Science Guy and fashion designer Michael Kors have in common? Blue jackets, a runway and the ultimate goal of raising awareness for prostate cancer. In partnership with the Janssen Pharmaceutical Companies of Johnson & Johnson, the second annual Blue Jacket Fashion Show – held on Feb. 7, during New York Fashion Week – benefitted the Prostate Cancer Foundation (PCF) to help raise awareness and funding for prostate cancer research. The Blue Jacket Fashion Show is designed so that the fashion, entertainment, health care and media worlds can collaborate around a national platform to openly discuss men's cancer issues, with an emphasis on prostate cancer. In conjunction with these efforts, models, actors, athletes and TV personalities all sported one-of-a-kind blue jackets for the cause. “There is this silence around the cancer. And when you have a room full of men walking a runway in clothes and talking about the issue, it is starting to normalize the conversation so that it becomes part of a culture that makes it ok to talk about prostate cancer,” said Colleen McKenna, vice president of Marketing and Communications at PCF. 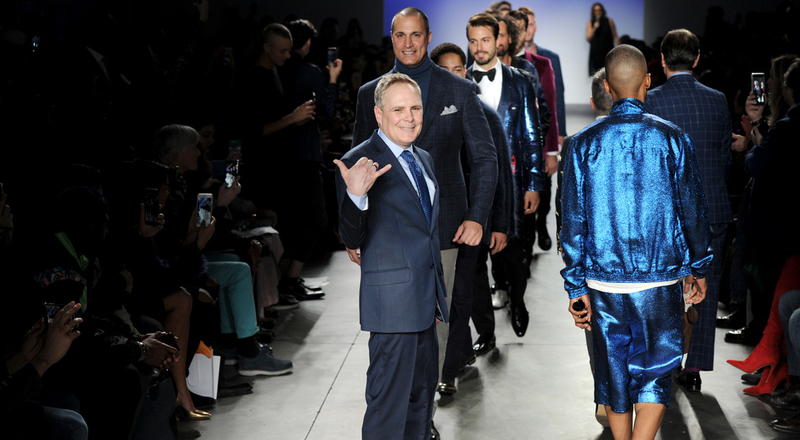 The show included designers such as Michael Kors, Joseph Abboud, John Varvatos, Theory, Todd Snyder, Ryan Seacrest, Thom Browne, Geoffrey Beene, Duckie Brown, Greg Norman, Nick Graham, Gustavo Moscoso, Haspel, Stephen Ferber, Bruno Magli, Son Jung Wan and Edwige Pierre – all by Josh Washington who used their creative talents to "reinvent" the traditional blue blazer. The celebrity models for the show – hosted by comedian Judy Gold – included TV personalities Dr. Mehmet Oz, Bill Nye, Nigel Barker, Dr. Mike Varshavski and Ryan Serhant; CNN Anchor Don Lemon; actors Mario Cantone, Dominic Fumusa, Eric West, Billy Porter and Jeremy Carver; NY Jets’ Buster Skrine; model Alex Lundqvist; Barney’s Creative Director Simon Doonan; and hip-hop artist Russian Roulette. Of note, this year’s show had one very special guest. This year’s star-studded event also featured patient advocate Todd Seals. In 2006, at the age of 42, Seals was diagnosed with stage 4 metastatic prostate cancer. Surgery was not a treatment option, and physicians gave him approximately one year to live. Since his diagnosis, Seals has become an advocate for the latest treatment advancements and for access and coverage for those with prostate cancer. While he describes his experience with prostate cancer as a “wild, crazy, wonderful ride,” Seals decided to add patient-turned-model to his advocacy résumé, too. All it took was one phone call, and Seals – who is a resident of a rural town in Washington state – was offered the opportunity to strut his stuff among celebrities and models, a moment he admitted he was a bit taken aback by. “How could I say no, right?” he questioned. So, after pleading with his boss to allow him to take a last-minute trip, Seals and his daughter ventured to the Big Apple so he could make his catwalk debut. Now that all is said and done with this year’s show, Seals plans to continue spreading a very important message to men with prostate cancer: Know there is hope. To learn more about the Blue Jacket Initiative, visit www.pcf.org/bluejacket.